one of my new favorite places to read about interesting things (or fonts and design) is the ministry of type and i am head over heels smitten. the crown alone is enough to make a girl swoon but the variety of the posts and the fact that every once in a while you read that you are looking at redrawn images which were made in order to "understand them better" just seals the deal. 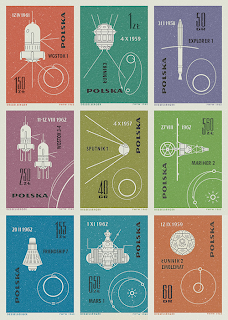 it was there that i found these wonderful stamps that make me feel a twinge of guilt for my excitement over the previously mentioned eames variety (though i still love them very much). 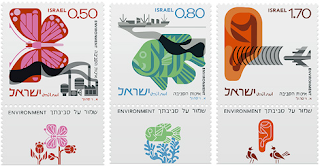 above, an israeli stamp collection depicting three environmental concerns, and below, one of those redrawn projects discussed previously, a polish collection of planets and various jet-propulsion devices. thank you ministry of type, i had a wonderful time. until next time.